Hello — Michael Longfellow here. We are super excited to announce the launch of our new Longfellow Guest House online store. We created this online store for our guests, and any Cape May fan that loves the beauty, history and unique qualities of our — America's oldest shore resort. 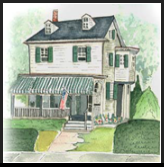 Our first online store products feature photographic prints, note cards and canvas prints that can make for the perfect gift for your Cape May event or celebration, or even as a thank you gift for a business associate. Each image has been selected from my portfolio of over 500+ Cape May mages portfolio (this website features many examples) that have been viewed online more than a half a million times. And each tells a unique story that captures a slice of Cape May in a beautiful and timeless way. These prints can make the perfect gift for weddings, family reunions, birthdays or even as a thank you to a business associate. The canvas prints are exclusive, limited edition signed prints (signed editions only for large prints). My Cape May photography has been featured in well known local publications such as Exit Zero, Cool Cape May, The Chalfonte Book, and also in Long Board Magazine, a national publication, as well helping in local fund raising drives. For our new online store, we've selected a few of the most popular Cape May photographs from my portfolio. Our canvas prints and frames are professionally crafted with the highest standards of quality and care and we guarantee our work. It's our hopes that these images bring you or a loved one joy for years to come, as a beautiful reminder of Cape May. Each print is signed (large prints only), so you'll know you're getting — or giving — a unique piece of art that can make the perfect gift. We designed the store and checkout process to be a simple and secure experience but if you if you have any questions about the process or about the prints, feel free to reach out. And don't forget to sign up for our mailing list (below) to learn when we introduce new photographic prints. We'll also use that list to announce specials and give aways, or to post fun promotions around my photography and prints. Thanks for stopping by. We look forward to hearing from you. Please add me to your regular Longfellow Guest House mailing list, too. When we announce new prints available for purchase, we will let you know. That's me and Jen. If you see me in town, be sure to give a shout out. Thanks for stopping by!